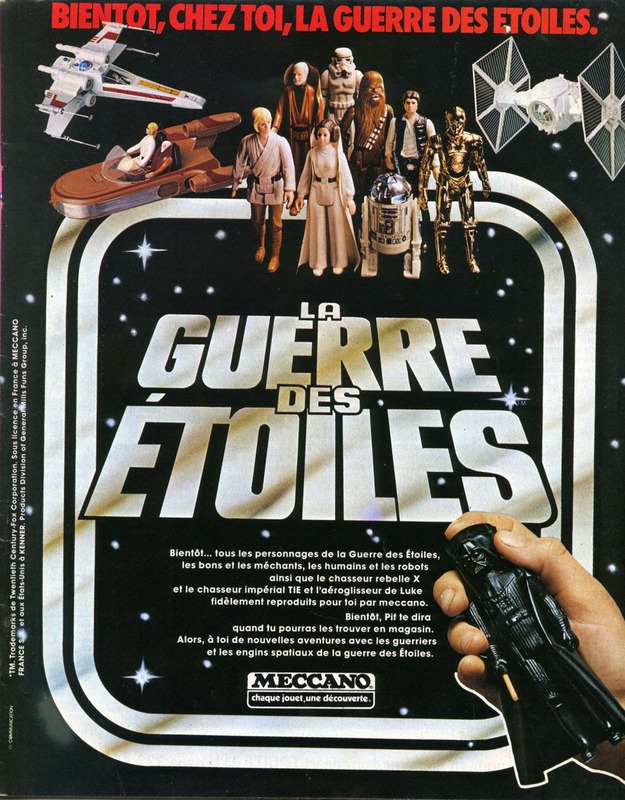 While doing continuous researches on MECCANO (vintage French licensee for Star Wars toys) marketing and advertising materials, I had noticed usage of some prototype mushroom-tip double-telescopic saber figures in several Meccano vintage French ads. The most evident one was the famous "Star Wars, Coming Soon to Your Home" full-page ad published in various child/youth magazines around April 1978. 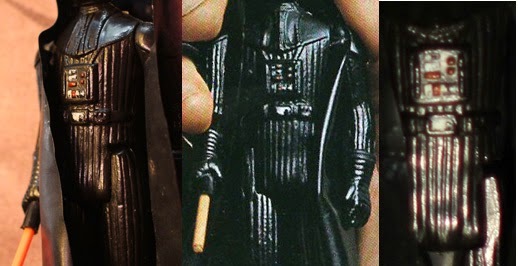 When looking closely at the Darth Vader figure, it appears that the saber has the small characteristic "mushroom-tip." 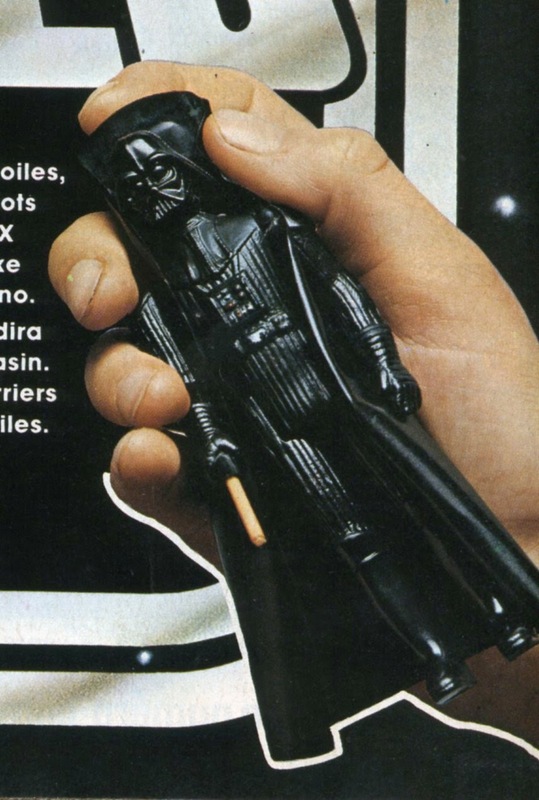 I got in touch with several collecting friends and prototype specialists in order to make sure this was the real thing, and try to understand how such a prototype (and possibly other, like the Luke in the same picture) ended up in France being shot by Meccano's marketing staff. Early 2010, I got in touch with Bill McBride to discuss about it. Bill was *the* guy to get in touch since he's known for having the largest run of vintage Vader figure prototypes, including DTs, and has an extensive knowledge about them. We both inspected several pictures of the Meccano advertising but without luck matching them with the DT figure. At that point, we concluded that the Vader in the Meccano ad was *the* second MT DT figure and that it was most likely sent over to Meccano for photography purposes, who probably kept it for future reference. It was an 'educated guess' based on the assumption that there were a few examples of prototypes sent from Kenner U.S.A. to other countries, and since Meccano, as a foreign licensee, needed the most finalized imagery to design their own documentation. In addition, Meccano was the only licensee to feature that particular ad and particular picture, which made it possible it was totally designed in-house. Thinking back about it in 2014, we were still skeptical about this though. I couldn't find any former Meccano employee recalling of having Star Wars action figure prototypes, even at the headquarters for demonstration purposes; and why would Kenner had sent prototypes for photography since they had hundreds of licensing stills especially designed for licensees. We had another discussion and I sent Bill some ultra-high definition of the Meccano Ad, which he then used to compare his Vader figure with the same angle... BINGO, that was it, not only he could match the figure, but even the saber details and the paint flaws, still the same almost 40 years later (looks at the paint wear on the belt/buckle - left is the actual figure, and middle the Meccano ad). So in the end, the new theory is that Kenner took a series of stock images, and sent whatever wasn't used to Meccano - which seems to be the only licensee so far to either have received or have made usage of these stills. This is a significant discovery, it's another fine example of how gathering materials from various licensees and analyzing the 'clues' can help matching pieces of history and providing a better understanding of the unsuspected connections between companies. More information about Bill's DT Vader can be read here. 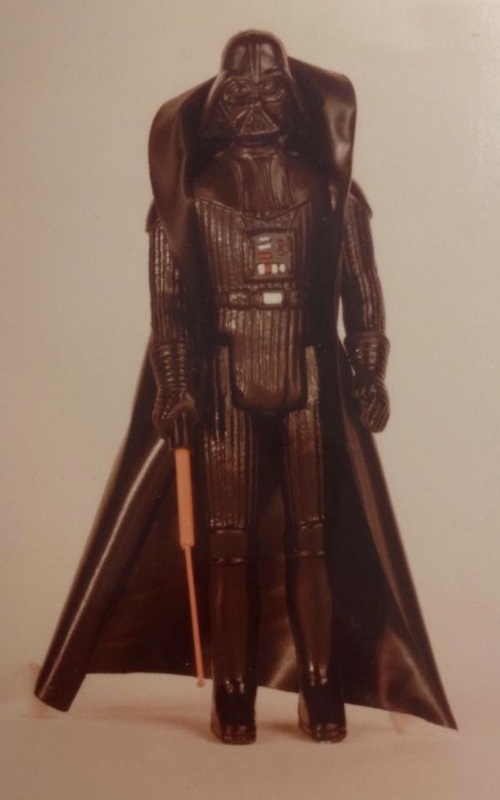 Another fine story about Kenner/Meccano connections is about the "Luke in Robes" prototype figure which was believed to be a recast planned for the 1985 POTF line, which was unveiled as the original 1983 project, thanks to the 1983 Meccano retailer catalog. Great read and what a discovery. To help me understand this further how did Mecanno get the license to distribute to the French market? I'm guessing that Kenner contacted potential licensees in other countries across the world, and we know who the lucky companies were, but did Kenner reps travel abroad with samples and materials meeting various toy manufacturers? Were there other companies who were offered the license? Sorry for lots of questions but did Meccano have to set promotional materials for approval from Lucasfilm, or Kenner, or did they have full autonomy? Not to be silly but could it be possible that a rep lost a Darth Vader while travelling and that photos/images of the most iconic character were shipped over?